As Arizonans, we’re pretty aware of dangers to our dogs and cats in the form of coyotes, bobcats, snakes, cactus and toxic plants. 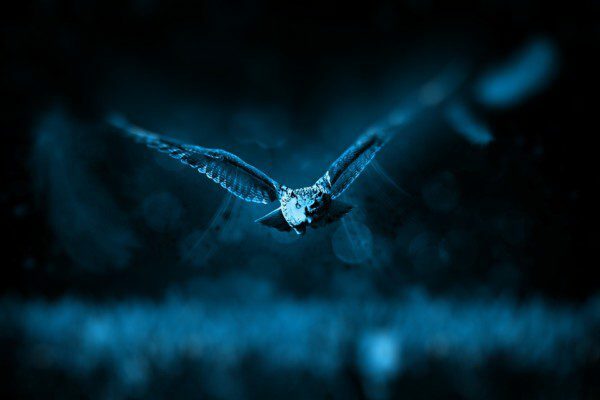 But, how many of you are aware of the dangers of hawks and owls? One family found out the hard way when their puppy was taken by an owl! A Scottsdale family discovered that their large puppy, a St. Bernard mix, was taken by an owl. It’s hard to believe that a bird could pick up an 11-pound puppy and get airborne, but that appears to be what happened. Bonnie Ziegler let Latte out for a short potty break on March 29. The puppy headed around the corner with her brother Oso, and never came back. 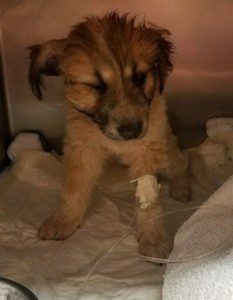 Later that afternoon, a group of golfers discovered the injured pup at Troon Country Club and rushed her to a veterinarian. 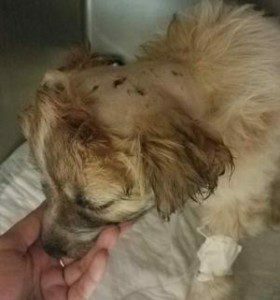 Latte had a collapsed lung, severe puncture marks all over her body, and fairly severe trauma to her head and neck. The veterinarian believes that an owl scooped her from the yard, but was unable to handle her weight and dropped her nearby. Latte’s story was not an isolated case. Every day, animals are taken by other animals from the sky, the desert, and even in the neighborhood. Make sure you keep your pets protected from hawks, owls, coyotes, bobcats and even mountain lions. What can you do to protect your pets from wildlife? There are many things you can do to protect your pet. If you live in an area that has access to the desert, you should take some extra precautions. The number one thing you can do to protect your pets is keep them in a fenced or fully enclosed area when they are outdoors. If you live in a remote area, consider installing a mesh snake fencing along the bottom of the enclosure. A simple way to do this is to utilize your existing home and add a pre-fabricated kennel to the home so your pets can go in and out through a doggy door at their will. 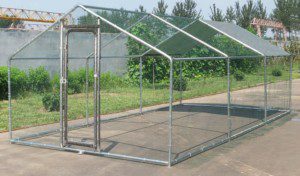 This large chicken coop provides plenty of room to run and is completely enclosed to protect from overhead predators like owls and hawks. If you live in a remote area, consider installing predator protection. These may include Nite Guard Solar Predator Lights that automatically display when they sense motion, or a motion-activated sprinkler. Keep in mind that these may work against your family or your pets if they’re caught unaware. Never allow small pets to be outside unless they are with you or inside an enclosure. If you feel as though your dog needs some extra time to walk outdoors or be near a safer area, be sure you hire a pet sitter to visit during the day or while you’re away from home. There are a number of dog jackets that are specifically designed to protect pets from overhead predators. Please remember these may cause your dog to be warm during extreme outside temperatures. Latte is still physically recovering and the psychological wounds will last much longer. She doesn’t want to leave the side of her humans and is still fearful. While Latte survived her injuries, many other animals are not as lucky.